Our Orlando airport shuttle services provide intercity transfers to over many destinations in Florida through most commonly used major highways which are I-95 and I-75. Covering the east and west coast of the state, you can choose the type of transportation that better fits your travel needs. It also covers the major airports and seaports as well. NOTE: Updated the test page using Thrive Content Builder. Our shuttle service of Orlando offers daily shared and private transfers from Orlando to many cities of Florida including the major cities such as: Miami, Fort Lauderdale, Fort Myers, Bradenton, Naples, Tampa, Melbourne, Cocoa Beach, Port Canaveral, West Palm Beach and many more. Including major airports, seaports, hotels and private residence. Our daily shared shuttle from Orlando brings an economical way for you to travel to all the major cities of the state of Florida. Many tourists and locals choose this option because it's very affordable and most convenient as well. The most flexible Orlando private shuttle bus gives you an option of a stress free ride to and from all the major cities of the state of Florida. It is also called a door to door service. This is your own shuttle at your own time. Sit back and enjoy the ride. The shuttle bus service of Orlando offers a transportation to major cities in Florida both on the East and West coast of the state for your convenience. The Orlando passenger transportation service counts with a convenient schedule for your convenience and comfort to one of your preferred destinations in Florida. 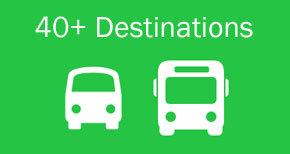 There are various shuttle bus providers from Orlando that may depart an hour later or before. It all really depends from where in the city of Orlando Florida you wish to depart from. We have a convenient station location for your convenience: WAWA Gas Station on South Semoran Blvd and International Drive. There are various routes you may take depending on the Orlando shuttle main station location you choose. If you take the shuttle from Orlando to Miami, most likely you will be taking the following routes: I75 and I95. If you take the shuttle service from Orlando to Tampa or Orlando to Lakeland, you will be going I75 South. And if you take shuttle service from Orlando to Boca Raton or Orlando to West Palm Beach, you will going I95 South. We do offer a door service with our Orlando daily shared shuttle bus. However, the mileage limitations do apply as it should be within 5 miles of distance from our main stations we serve in Orlando . Although, in any case you can always give us a call so we can help you with your door to door transportation service. Orlando FL nearby airports: Sarasota/Bradenton International Airport, St. Pete/Clearwater International Airport, Tampa International Airport. Also, we offer shuttle services from and to Orlando and all major cities in Florida. Also provide shuttle services to Orlando International airport shuttle service to Miami, Fort Lauderdale and all major cities including other airports and cruise terminals. Is an international airport 8 miles from the center of Bradenton Florida. Florida is very well recognized because of its amazing warm weather all year long, its beautiful sightseeing destinations and of course the amazing beaches. Tourists and even locals, love to visit different cities within the state. There are many fun destinations to visit. Therefore, if you're looking for a place to go and find out what to do, we invite you to visit the city of Orlando Official Page and/or take a look at our Travel Blog below for more information. Enjoy and Bon Voyage! Interested in finding out more about Florida and its historical places? You may visit Orlando Wikipedia for more information about Museums, historical places and fun spots. Why Should You Add Bradenton FL To Your Next Holiday Tour?